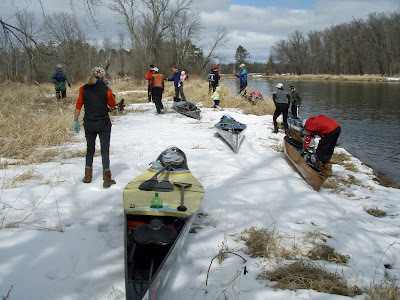 Several weeks ago Al Rudquist and Krista Matison invited anyone who wanted to come up to Grand Rapids and paddle this week-end. 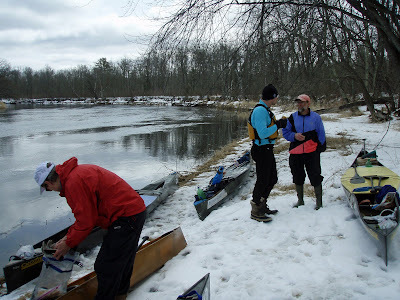 Al and Krista open up their home for their paddling friends. Several of us took them up this year. 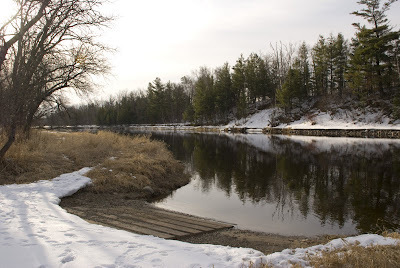 My father has a place on Pokegama Lake so I stay there when I go to Grand Rapids. This was my long week-end off so on Friday, 04-03-09, I went to the health club before heading off to Grand Rapids. I stopped in Aitkin for a Subway. 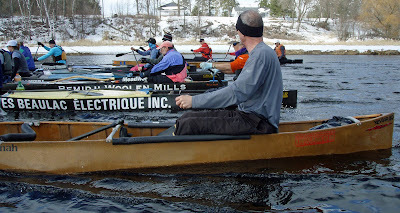 I also needed to buy a small lock because after Saturday’s paddle we were all planning to head over to the YMCA to hit the hot tub and sauna, so I went next door to the Hardware store. While there I was looking to pick up some neoprene gloves in case the temperatures were as low as the predicted. Well, I got the lock but they didn’t have any gloves. Driving up Highway 169 toward Grand Rapids I finished off my Subway sandwich. Just can’t beat that Chicken Breast sandwich! Instead of driving directly to my father’s place I decided to go into Grand Rapids to Glen’s Army and Navy store to see if I could find the neoprene gloves. I had bought a pair there a couple years earlier. Of course, I never used them and when I looked for them to bring on this trip I could only find one of them. That just wasn’t going to work. I got to Glen’s at about 5:45 pm. I was in luck they had three pair of the gloves although they were all x-large. I felt better knowing I had the gloves if I needed them. When I was driving the road to my dad’s I saw about 8 deer. I had my Olympus camera out and took a couple photos. 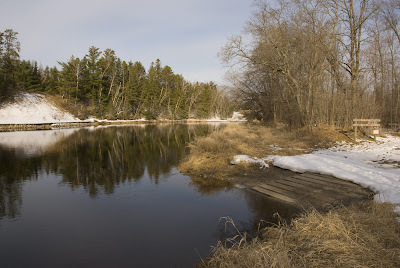 I formatted my camera the next day forgetting I took these photos, so I don’t have any shots of the deer. After arriving back at my dad’s and unpacking I called Krista. Krista told me they were expecting about 20 people this week-end. I asked who was coming and she started to rattle off some names- the three Canadians (Bill (Briggs), Dennis and Art), Kjell (Peterson), Anna (Peterson), Devin (Arenz), Io (Harberts), Kate (Ellis), Todd (Johnson), Todd (Ellison), Stephanie and Jason (Larsen), Fred (Rayman) and others. Then she asked if I wanted to go paddling tonight and I though for a second, but said no. Krista told me the plan for tomorrow. 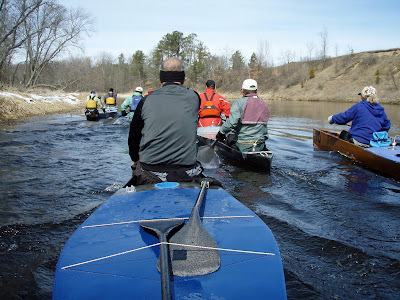 We were going to meet at Steamboat Park / Landing on the Mississippi River downstream of Blandin’s, paddle for 6 hours. 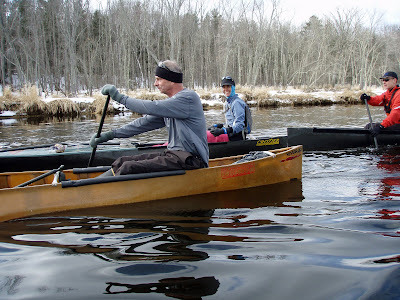 Al decided to do a loop, down and back up, paddle on the Mississippi because of the weather forecast. If we needed to turn around at any point because of the weather we could do so. 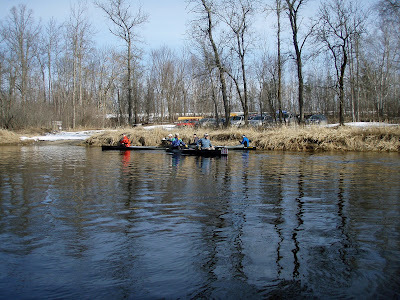 After about 2 ½ hours downstream there aren’t any places to stop until the 6 hour mark. Afterwards, we would head over to the YMCA a block or two away for a sauna and whirlpool, then head to their place for supper. I continued to read for a couple hours before heading to bed. I had set my alarm for 0700 am if I needed it, but I didn’t. I woke up at 0550 am but I didn’t actually crawl out of bed until 0645 am. 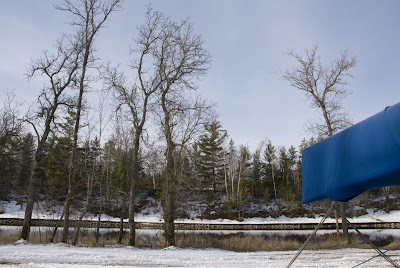 I looked outside and it appeared cool out, but maybe the reason was I was looking out over Pokegama Lake that was still ice covered. I went out to my Suburban and it was probably in the mid to high 20’s. The sun was up but it was behind some clouds. We were starting a little later today to give the temperature a little time to warm up. My morning breakfast consisted of my oatmeal and coffee. 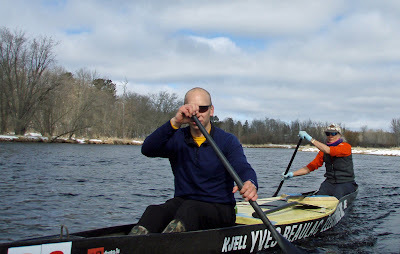 I began putting my clothes together for the paddle and the YMCA. I spoke to Marilyn our neighbor who told me if I was around later to come over and photograph the deer that have been coming around. She counted 25 last evening. I told her of my plans, so I didn’t expect to be around. Steamboat Park is about 20 to 25 minutes away from my dad’s place. I left the house at about 0900 am with the temperature at 32 degrees. When I pulled in the small parking area I saw Fred Rayman. I rolled down my window to say hi! He told me he had arrived about 10 minutes earlier. His van door was wide open so I mentioned to him that I was going to back up next to him and park. When I got out we started to talk. I heard a hissing sound coming from somewhere by my rear quarter panel. Upon further inspection I saw a nail sticking in my tire with small air bubbles coming out from around the nail. The leak was small but eventually the tire would completely deflate the tire. I thought of driving somewhere to have the tire taken off and patched, but I didn’t know where to go. Fred told me he would help change the tire, so that’s what we did. I knew it would be better to change it now while I was fresh instead of after 6 hours of paddling in the 30 degree temperatures. 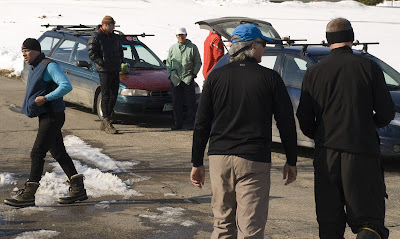 While I changed the tire other people began showing up at the landing. I heard all the, hellos; hi! How you been? ; How was your winter? ; Did you do a lot of skiing?, etc. I never heard any one say, What the hell are we doing today? Actually everyone appeared all excited to be paddling. 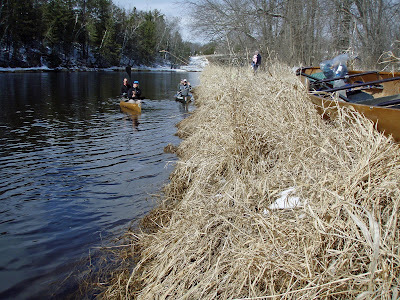 There were some in the group that today was going to be their first paddle of the season. They may as well start it off with a bang, a six hour paddle. 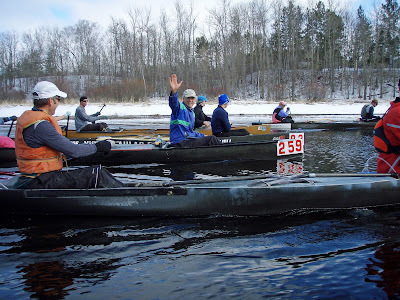 Al Rudquist arrived with his sheet of paper in hand with the names of who was paddling with whom. Once our names were read we were asked to stand by our canoe partners. Since Todd Ellison was talking to me and didn’t hear what Al said, Kate walked over to him and stood. 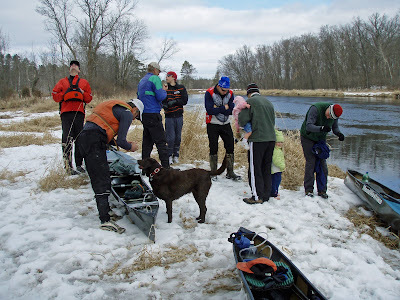 Here is who was on the list and paddling with whom: Bill Briggs and Art; Al Rudquist and Krista Matison; Todd Johnson and Sage Matison (? ); Devin Arenz and Fred Rayman; Ed Arenz and Rick Lorenzen; Todd Ellison and Kate Ellis; Io Harberts and Kjell Peterson, Anna Peterson with Stephanie Larsen to start with then Jason Larsen. 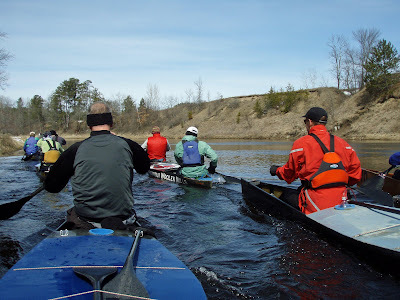 I would be paddling with one of the three Canadians, Dennis Leneveaue (?). Dennis would paddle the bow and I would be in the stern. 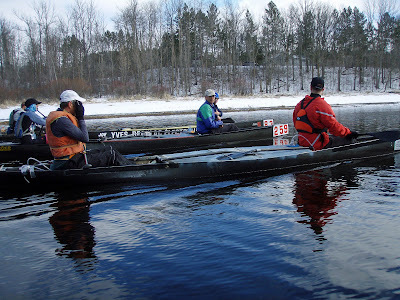 The canoe was prepared and I put in my two dry bags. My bigger of the two bags are clothes in case I go over. I have this bag with me in the early season paddles when I’m in my C-1. The other smaller dry bag is for clothes, gloves, hats that I may need on any particular paddle. Dennis and I were on the Mississippi River at 1022 am. 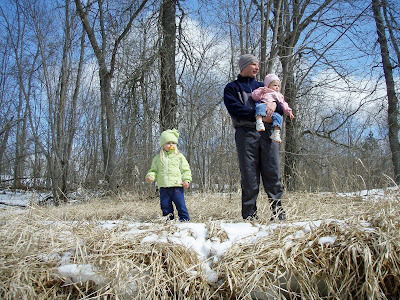 Jason was on shore with his two small children and their dog as we paddled off downstream. Jason was going to switch places with Stephanie after a couple hours and then Stephanie would watch the kids and dog. Everyone paddled downstream with the usual banter going back and forth. It was actually not a bad day to paddle if you were prepared for it. 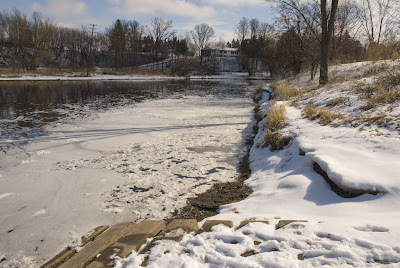 There were some sections in the meandering river where we could feel the wind in our faces. The sun was out to raise our spirits. It took 1 hour and 5 minutes down to the Blackberry Bridge. Jason was there with the kids, but he wouldn’t get to paddle at this stop. Surprisingly there was no one else in the parking lot or on the river. 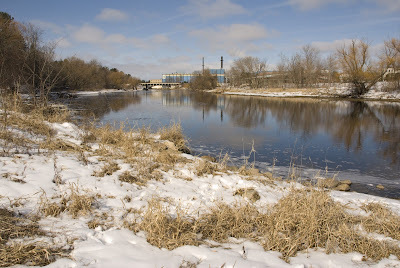 The next stop was another landing downstream approximately one hour and twenty minutes away. This would be where Jason would change places with Stephanie. 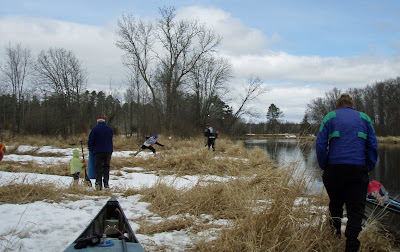 When we got to this landing Jason and Stephanie switched places, Rick Lorenzen and Ed Arenz stopped upstream of the landing that prevented them from joining us as a group because of the open water of a stream between them and the landing. I don’t know how that happened, but it did. So what happened next was a short snowball fight between those two and some on our side. 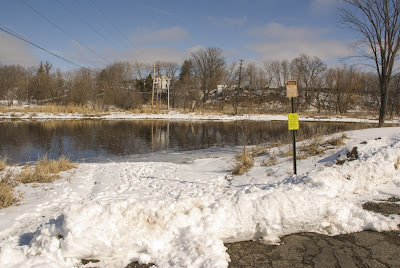 This was our turn around spot and we all headed back upstream. The banter wasn’t as furious as earlier on in our paddle. I could tell Dennis was getting tired, but he continued to plug along. 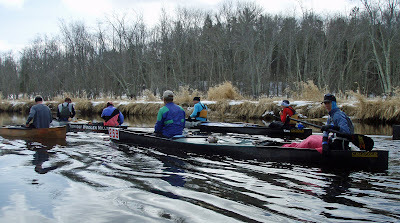 We got back to Steamboat Landing at 0434 pm giving us a six hour and twelve minute paddle. Back at the landing I said good-bye to Fred Rayman who was going to drive back to Ely. While the others were excited about heading to the YMCA I had to find a place to go and get my flat tire repaired. I drove to Wal-Mart to see if they could repair it. Two of the employees looked at the nail and said it was questionable because of the nail’s angle, but they wouldn’t know until they pulled the tire off the rim. Well, I was able to get it repaired. It was now 6:30 pm and the YMCA closed at 7 pm. Since I was starving I drove to Subway and got a foot long Chicken Breast sub. I wasn’t going to eat the whole thing, but by the time I decided I had already eaten the thing. I went back to my father’s place and got ready for the next days paddle. I should say I rested then went to sleep. I had my share of fresh air and exercise today. 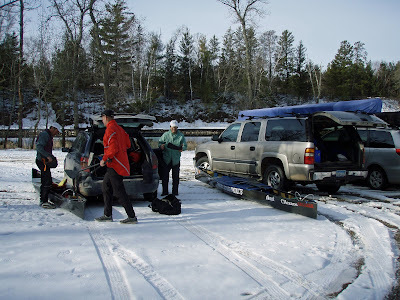 It was decided yesterday that we would start our paddling day at 0900 am at Blackberry, since some had to drive a ways back home. This was planned as a shorter 3 hour paddle. When I awoke at 0600 am it was cooler outside than yesterday morning. The high was only to get to 37 degrees today. It looked like I would get to use my new neoprene gloves this morning. When I left the house at 8 am it was 27 degrees. It stayed at 27 degrees the entire drive to Blackberry. I arrive about 0830 hours and got out of the Suburban to walk around. I took a few photos before everyone began showing up. 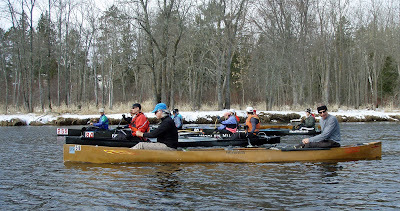 There were a few new faces from yesterday and some from yesterday who didn’t paddle today. The group today was Bill and Art; Dennis and Devin; Al and Ed; Kate and Todd Ellison; Joe Dunaisky and Todd Johnson, Io would be with Jason and Stephanie; Rick and I.
Rick and I were on the water at 0915 am. After a few strokes Rick said he was already too warm. 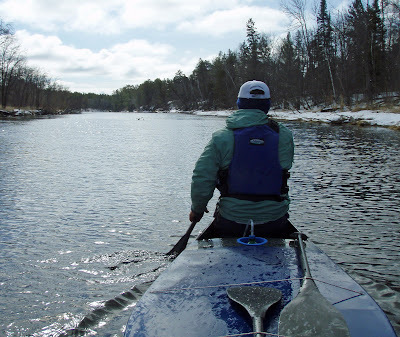 Again, if you were prepared for the cold it wasn’t that bad of a day to be paddling. Joe Dunaisky said he had hurt his shoulder skiing this past winter and today was his first paddle of the year. He said he can’t raise his arm up but it doesn’t feel too bad when doing the paddling motion. Well, there won’t be any portaging so that’s the good news. Today’s paddle was three hours long. 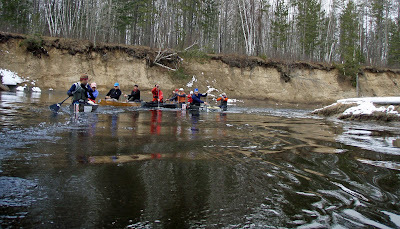 There was more sprints and hard paddling around the shallow bends of the river than yesterday. When we got to the turn around Joe Dunaisky opted to stop since his shoulder was bothering him. Todd Johnson and Joe got a ride back with Jason who switched with Stephanie. When I left the landing the temperature was 35 degrees. This was another fun week-end. Maybe some more of you will join us next year. Thank you to Al and Krista for putting this paddle on. 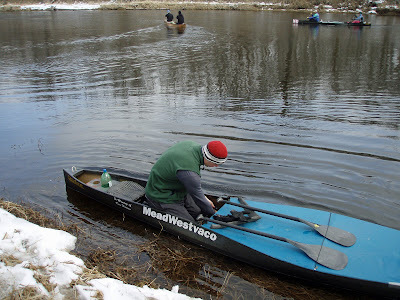 Who knows there might be other paddles in Grand Rapids this summer? Stay tuned….